Visitors entering Coffeyville from the south have long been awed by the sight of the three-story 16-room W.P. Brown home. 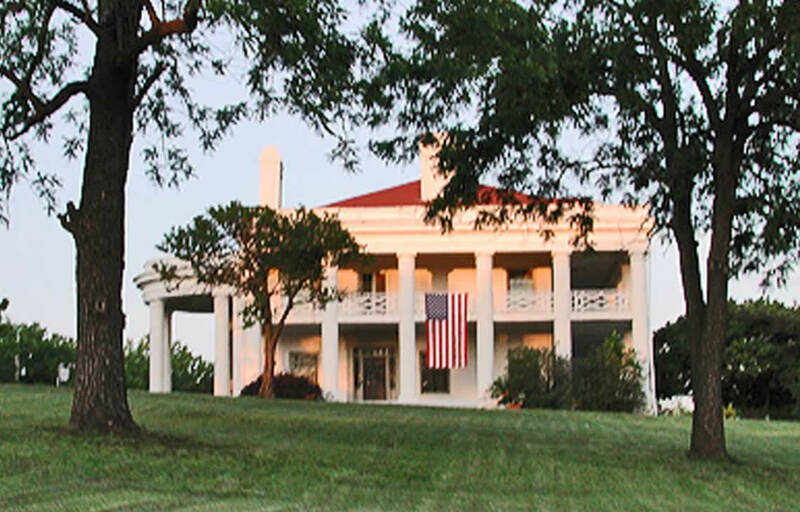 Listed on the National Register of Historic Places, the beautiful home is situated in a commanding position atop a hill. Inviting first and second-story verandas grace the south and west sides. An ornate portico tops the porte cochere. These and other features have caused the home to be labeled the “Brown Mansion” ever since its completion in 1906. The main floor includes a two-story entry, living room, parlor, music room, library, solarium, dining room, billiard room, kitchen, and maid’s quarters. Five bedrooms and three full baths are on the second floor. The entire third floor is a ballroom which at times served as a schoolroom and gymnasium for the Brown’s son. A full basement houses the butler’s quarters, laundry, heating system, walk-in-icebox, wine cellar, and storage rooms. The 20-inch-thick brick and concrete walls serve as insulation for the gas heating system. Chandeliers are powered by both gas and electricity. Some rooms have original hand painted canvas wall coverings. Tiffany leaded-glass accents the main doorway, and a signed Tiffany chandelier in the dining room is believed to have been hung by the designer personally. The mansion is furnished with much of the original furniture used by the Browns. They purchased some pieces from Marshall Fields of Chicago and Sloans of New York; other pieces were obtained during family trips to Europe. W.P. Brown began plans for this lovely Coffeyville home around the turn of the century, contracting with the architectural firm of Wilder and Wight of Kansas City, Missouri. As both Edward Wilder and Thomas Wight had worked and studied with Stanford White, the Mansion has similarities to several of White’s designs, such as the Patterson Mansion on DuPont Circle in Washington, D.C. and to the library he designed in Chattanooga, Tennessee. The Inglenook in the Brown Mansion is similar to the one White designed for his friend Louis Co mfort Tiffany. Like typical Stanford White structures, the mansion has many fireplaces, all of different designs. Because Mr. Brown owned a lumberyard as well as having oil and gas interests, the mansion was completed at a wholesale cost of only $125,000.